How to resist to delicious no-bake Dark Chocolate truffles? Quick and easy to prepare, these bittersweet treats will delight either your tea time or your family dinner. Grate or chop in very small pieces the dark chocolate and set aside in a large bowl. In a small pot warm the milk and melt in it the butter. Add one teaspoon of vanilla extract. Heat until almost boiling. Immediately pour the hot milk on top of the chocolate and quickly mix with a spoon to obtain an homogeneous cream. Let chill until the chocolate cream is cold enough to be worked with your bare hands. If too hard mix vigorously to softness. In the meantime, prepare small bowls filled with cocoa powder, coconut powder or grated almonds. When chilled enough use the dark chocolate cream to shape small balls of no more than 1 inch of diameter. You should obtain around 15 truffles using the quantities in this recipe. 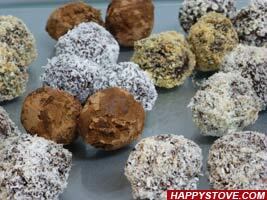 Roll the truffles into the cocoa powder, the coconut powder or the grated almonds and lay on a large baking tray. Refrigerate the dark chocolate truffles. Remove from the fridge about one hour before serving for best texture of the bittersweet pastries. You can coat the truffles with your favorite grated nuts, pistachios, grated white chocolate or crumbled cookies. Tenerina Cake is a traditional Italian chocolate dessert similar to brownies. Invented in the early 1900 in the city of Ferrara, is a delicious and yummy cake. Submitted by Paola A. Beef Strips in Dark Chocolate Marinate is an unusual meat recipe that blends the warm and rich taste of dark chocolate with the deep red wine flavor. The spicy touch of the red pepper contrasts with the honey sweetness. The result is a stunning beef meal. A must try.